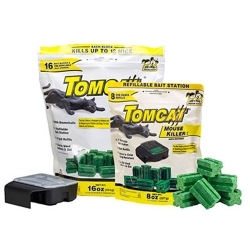 Tomcat Mouse Killer I Bait Station is a refillable mouse bait station that includes 1 oz Tomcat Chunx bait refills. 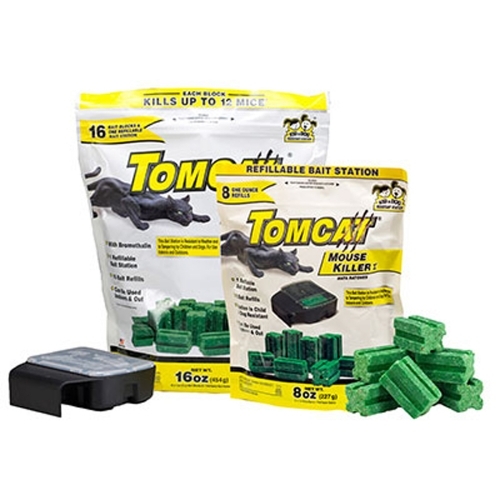 For use in controlling mice indoors and outdoors. Features a clear lid for easy monitoring and portico to ensure proper placement and encourage entry. Child and dog resistant. Use 1 station per placement, spaced at 8-12 ft intervals. Each 1 oz Chunx is capable of killing up to 12 mice. Packaged in resealable bag. Made in the USA.